Make fresh air your morning ally. Have a morning walk immediately after you got out of bed to enjoy the fresh air. Make natural air become your new „coffee in the morning“. I will be honest with you. The way you are craving for coffee is ugly. I do not like how you act like a junky longing for caffeine. If you cannot have a proper day without your dose, change what you are doing. As a child, teenager and young adult you did not need coffee to have an awesome and productive day. Why do you need it now as a working adult? To stay awake? Then sleep more or do more sports. I am all about natural drive, everything that comes from within — not taking artificial substances. I know you need to eat and drink but I want to add as many natural substances to my body and soul as possible. Related side note: I am eating vegetarian food and fish as the only meat. This is not ideal since I aim to eat vegetarian only (as my personal challenge). Also, I took an artificial substance once in my life which is why I know that I do not want to have this experience anymore. I am not judging you as a person, I am judging your motives why you need coffee or why you think you need coffee. I want you to question what you are doing when you feel things are off in terms of your happiness (because you are complaining too much), in terms of reaching your goals or in your relationship. A morning routine cannot solve all these challenges in life at once but what you do in the morning and how you spend the first moments is giving your day a direction. Of course a day can be 180 degrees different in the evening compared to how it started (from bad to good and vice versa), but why not have a good day from the beginning on and throughout the day. I believe having a stable morning routine will make you happy for your whole life because when you start with a small win, you created your own little kick-off. As you know, kick-offs have the psychological power to help you continue, endure and finish a thing. Tonight, before you go to bed, prepare your clothes and shoes (you normally wear) in front of your bed or close by. Set your alarm so that you get up 20 minutes earlier than usual. When you need 7 hours of sleep and usually get up at 6am, go to bed at 10.40pm instead of 11pm. You then get up at 5.40am, leave your bed and directly put on your clothes and shoes so you are ready to walk outside for 20 minutes. Your keys for the house are also nearby so it is a no-brainer for you to leave the house. Back home answer for yourself: How did it feel? Now continue your usual morning routine and go to bed at 10.40pm again. Repeat it for 3-4 weeks and see how it goes. You can make small adjustments on the way, but not too many and only subtle, like where you put your clothes, what you wear or what route you walk. A too big change can cause severe damage to a habit that is not an adult yet. It is as if you asked a fresh-born baby to run 10K. You get the image. Count the days on which you woke up and walked, and call them a success. Having woken up and walked you had a 100 % day already. You start with a success – your self-initiated kick-off. Everything else you do after (work, leisure, family) is a bonus, a success you out on top. At the end of the day you had a 100 % day only because you got up a bit earlier than usual and walked 20 minutes. Therefore, a normal work day becomes a 100 % day plus bonus. How encouraging is that? How good does it feel for you? Get up even earlier to take even further advantage of the morning, maybe for personal activities you usually did not find the time for at the end of the day. If you drink coffee as a tool to wake up, try this: After your finished morning walk put less amount of coffee into your cup, for example 75 % of what you normally drink. Does it make a difference for your day? Are you really more tired? 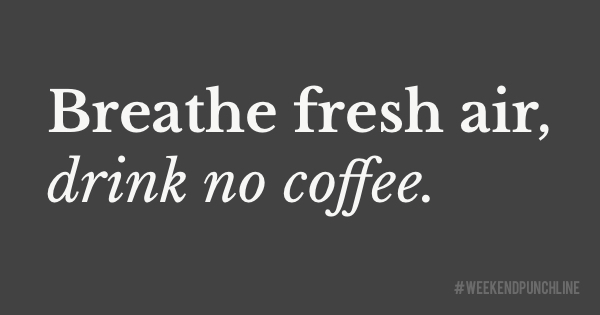 My theory is: Fresh air in the morning can replace coffee completely. So, try to walk a bit longer, like 25 or 30 minutes and put less amount of coffee into your cup. Try it. Does the amount of walking correlate with how much coffee you need in order to have a rich and „awakened“ day? Similar to what I described before will you then call a day a 100 % success when you got early, did your morning walk and drank less coffee (75 % as an example). Do this for 3-4 weeks and make this habit. Again, always ask: How does it feel? Do not question that you are doing. Question how you can improve doing it. When you reconquer the morning as your friend, you will embrace its energies and benefit from the mutual synergies. Have an energetic kick-off tomorrow morning! This was episode 24 of the #weekendpunchline . Every Saturday and Sunday.